You will probably like this game if you like space action games. In Glider you fly a space glider and fight aliens. The glider and the alien ships only move on a blue grid. While doing this the aliens and the gilder shoot at each other. The gilder pilot has bombs and missiles to hit the alien ships. Occasionally it is possible to collect colored bonus points to get additional shield power, fuel, missiles and bombs. 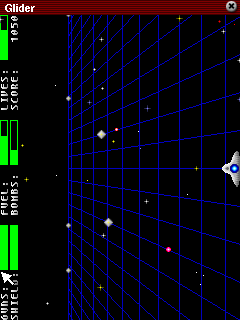 The Gilder game has fast graphics which gives a nice impression of a space game. Although it is simple and actually not so fast it makes the impression of a fast paced game. The handling is also good and easy. There are a lot of nice options like shields, bombs, missiles and fuel. So why does this game then not get a fantastic rating? This is mainly due to the fact that it is much too easy. It is basically impossible to loose the game. Also after the first few hundered destroyed space ships you would hope for some variations in aliens, attack patterns etc. Due to these fact the game does not keep you playing for very long. As the game is free it is still worth a go and test it.